Another picture perfect day with excellent sailing conditions. The wind was a bit lighter today starting out at 11 knots and dropping to 8 by the finish. The fleet was well behaved on the starting line so no Black Flag today and no one was over early. We had another great start and were in the top 5 at the first mark. Not going super fast but ok. There weren’t any big shifts out there today as the wind oscillated up and down 5 degrees around 165M. Brian Cramer of Canada got to the first mark first with and we were just behind the Brazilians Lars Grael and Jorge Zarif. Unfortunately we were slow again down wind today and lost about 5 boats on each run. 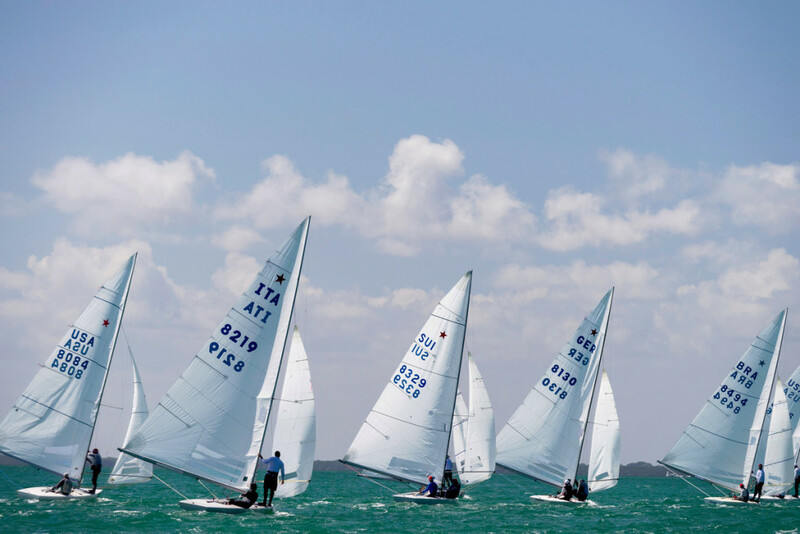 We rounded the second windward mark 7th and finished 12th. I am really scratching my head on this one but I am sure I will figure it out. A bit late for this regatta but I guess life is that way. You just keep learning and in some cases relearning. Zarif leads by one point over Lars Grael who is the defending champ. Mark Reynolds with Magnus Liljedahl are in third place, Torben Grael in 4th, Augie Diaz in 5th and Brian and I are in 6th. The points are close enough that we can move up or down with two races to go. The forecast for tomorrow is light…6-8 knots of wind. That could mix things up a bit as a lot more boats will be competitive and if there is any substantial wind shift, it won’t be hard to be mid fleet at the first mark. Saturday is forecast to be back on the 10-12 knots which is pure boats speed weather.